Just another quickie post tonight - I am tres exhausted right meow. a 10.5 hour work day.. I mean, it went by in the blink of an eye, but that is my problem.. I didn't keep my eyes closed enough last night. Derp. 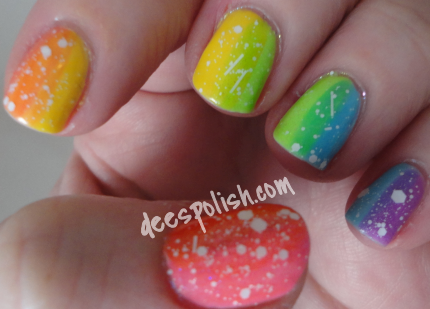 I decided to do a faux-gradient for today.. meaning, I was too lazy to bust out the sponge.. sorry! But it is still super fun looking! I also broke/clipped down my nails. That is fun. I started this whole process with a base of white, China Glaze White Out, to be exact, then I did numerous layers of: Girly Bits Jelly Shoes, Sailors Delight, Banana Hammock, Glo Worm, and Arctic Sunrise, as well as Dollish Polish Aca-Awkward! Then I added a layer of FxFS Wham! for kicks. Pretty pleased with how these gems turned out. I am off for now.. need sleep! Goodnight -- and see you all again tomorrow! !